A number of members within The Hibiscus Coast Kayak Fishing Club are keen for the club to consider a catch and release ladder (C&R) for the new club year to be run in conjunction with the current pointâ€™s ladder. This is in the forum so that those members with thoughts on how this could work can discuss without all of us being bombarded with email through our Inboxes and those that wish to participate in the discussions can do so freely and separately from the total membership with the idea that we can put a workable solution to the club executive. Any C&R ladder will be passed by the committee if it is seen to be sanctioned by the majority of the club members and also a clear understanding of how any ladder of this type would work. Can members participate in both ladders? Assuming yes can they participate in both ladders at the same club event. Do we have 2 sweeps at each club event or is C&R an annual prize. 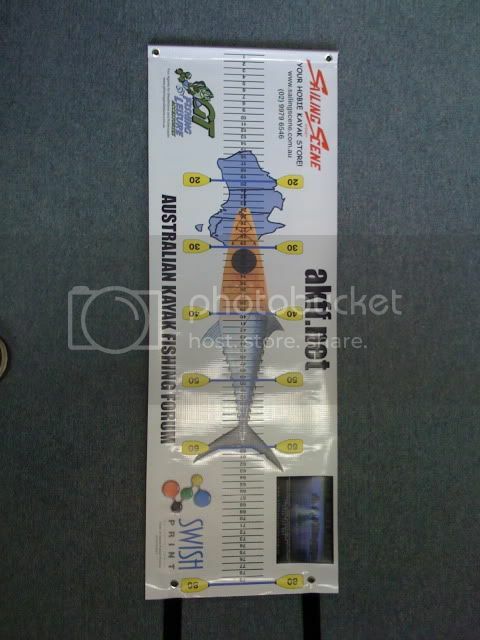 Is it for Snapper only or do we add another ladder for Kingfish as well. How would the points work. It has been discussed that length in C&R is the fairest option with points given in 2 sizes ranges being the size equivalent of 10 -15lb and 15lb plus. Obviously sizes would need to also be discussed and set. Most importantly for any C&R program to work the fish need to be treated with the utmost care and considerable discussion and advice would be needed and sort as to how this should take place. Some thought has been given to knotless nets. Over the coming months it gives us all a chance to try the various methods and discuss here in the forums as to what appears to work and to also take advice from the experts. So that we have a workable solution. At the start of the of any club event all participants in the C&R ladder would be given a random token with a number. This number would be recorded alongside the club members name and would vary from event to event. This token could also be part of the clubs safety protocols. Any fish that a club member catches that they would like to release would be kept in the water placed alongside a measuring stick or tape on the side of their kayak and a photo taken by another kayaker. Any photo would also include the token with its number clearly visible to prove that it has been caught on the day. The measuring stick could be painted 2 different bright colors so that its size could be clearly visible and enable ease of pointâ€™s allocation. Again trials over the months ahead will enable a workable solution. If you have any comments or thoughts please feel free to post. I would only see the C&R as an annual ladder so it wouldn't really be a club event as such, all processing would be post event anyway, i.e. all photographs need to be forwarded to the C&R club official for collation and recording, so it wouldn't be an "on the day" event as such. No C&R should be annual, and the trophy and/or sponsored prizes would be the only reward unless we all want to put in say $10 as a sweep for the annual ladder? Keep it simple, 1 point per centimeter of fish over a minimum limit, set the minimum C&R measure limit to say 30cm (you can't claim points for anything under 30cm). So a 36cm Snapper would net you 36 points, a 58cm Snapper 58 points, a 29cm Snapper zero points. and no half measures, only count full centimeters, always round down, so 32 and three quarters only gets 32 points. Even with a knotless net there is still a requirement to "man handle" the fish out of the net for measurement purposes so this just seems like double handling to me..? Yes these are very easy to use, do not puncture the skin of the fish at all, and do seem very popular on the tournament circuit in the US for C&R competitions BUT this is only with small Bass of course.. I'm also happy to help with this system, it's also the same system that we want to use to run the monthly competition on this forum, so a solution to the measuring and recording would be benificial to us all Would also be nice to see the same system rolled into the 2011 Nationals... Do we really want to invite everyone into our back yard and ask them to remove all our good fish..? Just a suggestion re:points system. Rather than point per cm, what about one point per 5cm? Most (if not all paddles float) Why not photograph fish in water with paddle alongside? Graduations are easily added with insulation tape of different colours. I agree with the hairy one, here is my idea of points. clour graduated stick, strip or paddle, points range per colour, one fish per colour (prevents photoing the same fish twice) max 3 fish per species will try and put my grahpic on here else will attach it. example red 45-55cm-1 point, blue-55-65 cm 2 points, yellow 65-75 cm 3 points, etc. 1. How do you identify the day or event that the fish was caught at? May be write the identity number on the last band with a black sharpe and replace the tape each time? 2. Why limit it to only three fish? the most you could ever score at any event would be six points is that correct? My post is an example only which can be thought about and finessed. The stick or flexible cloured tape measure or whatever could extend to 1m giving a range of about 1- 8 points say. The cours are a simple way of allocating points. What does it matter what day it is, we need to trust each other, the comment about 1 photo per clour was not in any way meant that we dont trust each other, but seriously 50 snapper could look like the same fish or one could like 50. It brings down the numbers weighed in, and just creates a point of difference. I am not keen on saying look I caught and released a hundred fish! Also Often one catches heaps of fish all around the same size, I see no future in 'measuring' in 10 35 cm fish, it would be much more of a challenge to catch a range of fish. 3 fish at 3 per species means we are not reinventing the wheel, we can weigh in 9-12 or so fish with this suggestion per comp, we also do not want to make this a cumbersome tiresome chore for the administrator. These can be tallied per comp to determine a winner every comp. Also a moving fish or paddle in the water means the measurements are never going to be precise, a 10cm gap gives leeway for a reasonable measurement or cataegory for the fish to fit into. I really like the way this C&R plan is going. My thoughts would be that for the the purpose of finding a 'winner' that only larger fish should be recognised. The idea of a larger size bands (ie. 50-65 = 1pt, 66-80 = 3pts, 81+ = 6pts) and a focus on bigger fish will reduce the propencity of a large number of small fish being targeted. As far as numbers go, we are allowed 9 Snapper a day under Fisheries regs. So why not allow a total of 9 wieghed or C&R fish? Awesome ! Saw those on the Aussie forum and thought they would be great for showing off catches here... Though seems the Aussies measure to tail tip instead of the 'V' of the tail. Guys keep it coming we have some good ideas coming forward... Speaking to a few people today most are of the opinion this is for fish larger than 600mm the current club min is 450 mm It is about keeping the older breeding fish still alive.